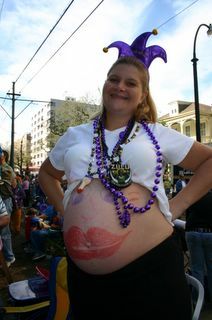 We enjoyed a great Mardi Gras weekend. 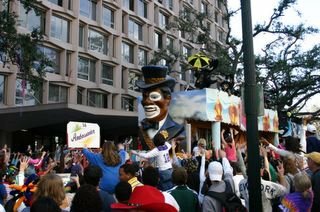 We’re both still of mixed minds about the whole affair: we love Mardi Gras and thoroughly enjoyed it; we think it is great that area businesses are reporting over $200 million in revenue; and we are eager to see if the funds actually get put back into the city’s failing infrastructure. There were some differences this year… shorter parades, less parades, and less days of rolling krewes. On the parade route, there were less port-a-potties (I waited in line at a nearby bar when I had to go today), and the intense street cleaning crews weren’t quite out in the same force as previous years. (They are *impressive* to watch.) Word on the town is that the crowds were much smaller this year, but to us, it seemed full and fine. 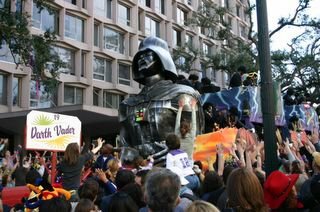 Then again, we stick to the Uptown festivities where the families hang out — and where it is relatively easy for your kids to get throws, have cook-outs, play frisbee, and enjoy other common Uptown Mardi Gras fun. 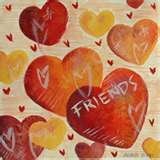 – A TON of beads!!! 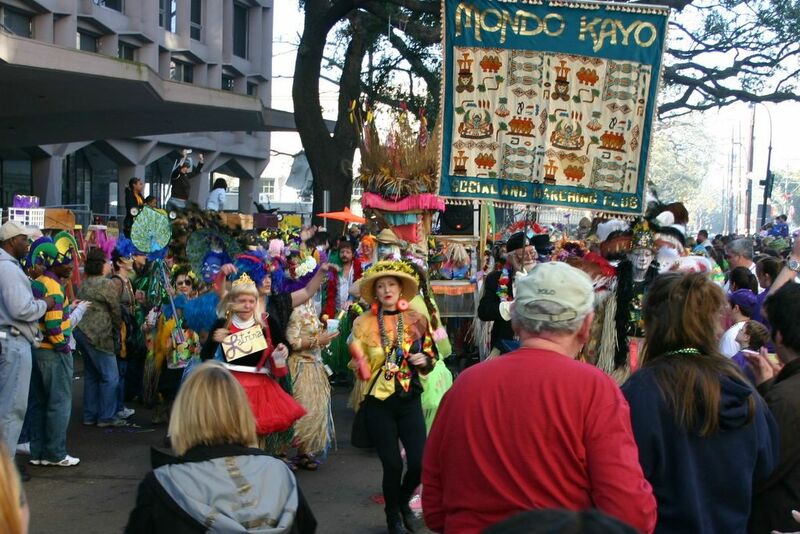 Mondo Kayo and Pete Fountain’s “Half Fast Walking Group” kicked off the morning! 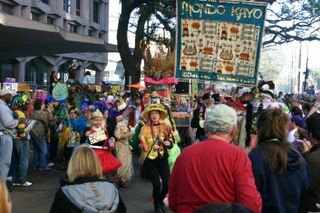 These two local traditions march before Zulu on Mardi Gras morning. We did get one of the medallion necklaces from Pete’s group and it is one of my favorites from the day. This was also the first year since they started in 1961 that Pete wasn’t with the walking club for Mardi Gras morning (he was ill). How we entertained Will before the parades began! 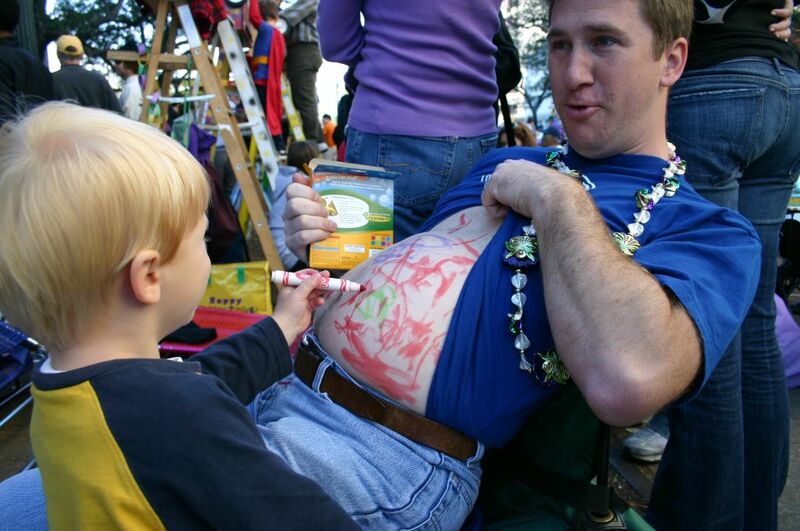 Once Paul decorated my belly, Will insisted on helping Paul share in the fun. He also decorated his own and gave us markers to help him. 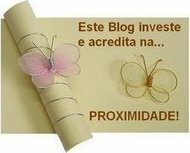 We wrote: “If found, please return to Zoo.” For the rest of the day, Will showed everyone his belly to great amusement! 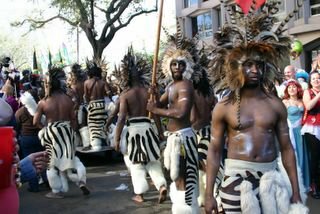 This year, Zulu featured a group of Africans (I’m not sure if they are actually from the Zulu tribe in South Africa or not, although that would sort of be the point). Zulu is a crowd favorite! See all those hands in the air? And the roar that goes up when a rider has a coconut in their hands — wow! 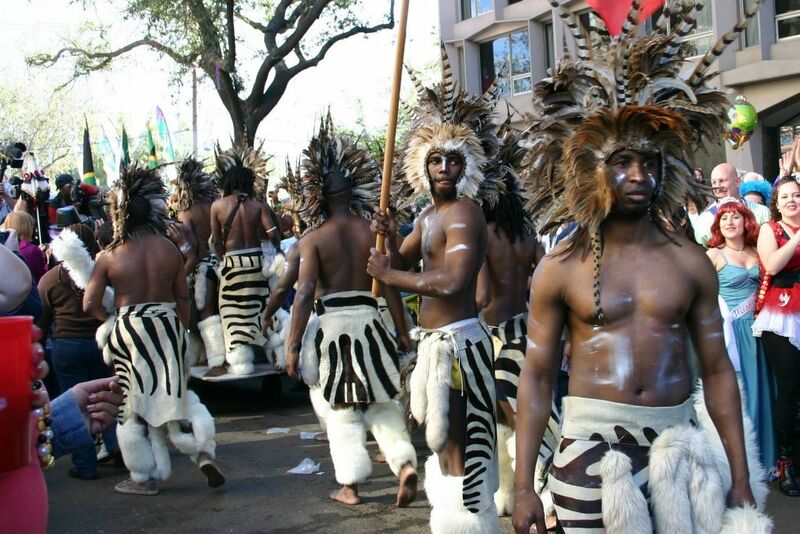 Zulu is filled with fantastic music of all kinds and great throws. 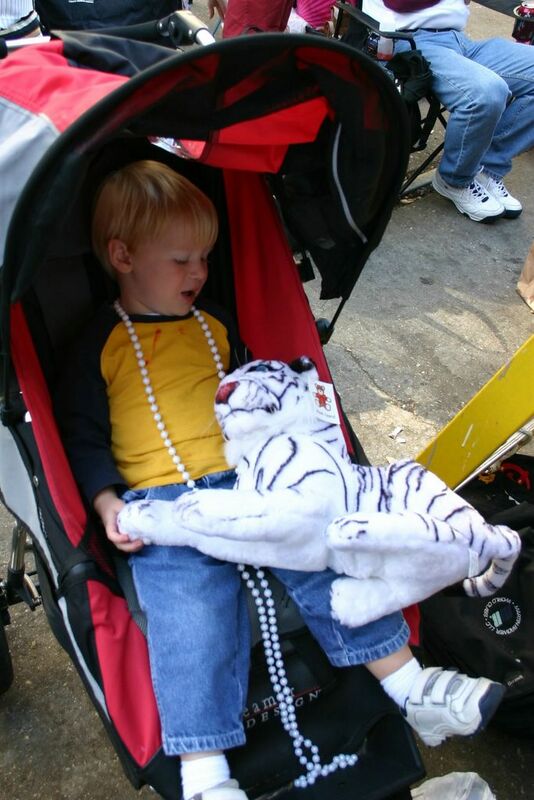 Will got a music wand, stuffed toys (many of which we gave to other kids), some great beads, and medallions. And YES — we got a coconut!!! Because coconuts aren’t usually thrown (you have to be right up on the float to get one), one of the families around us that we befriended got one for me — I’m not sure if a rider designated it for me or not. 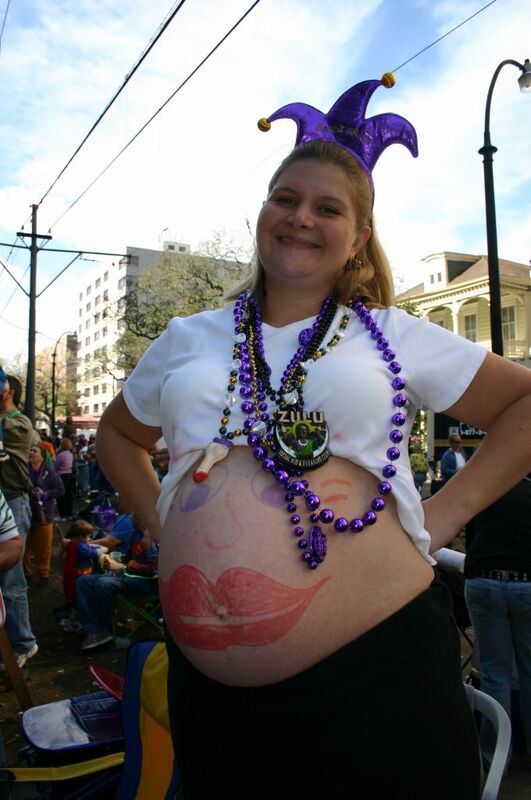 There were some super-fun families around and they watched out for me and the belly! Will talking to the huge stuffed tiger we caught from Zulu! 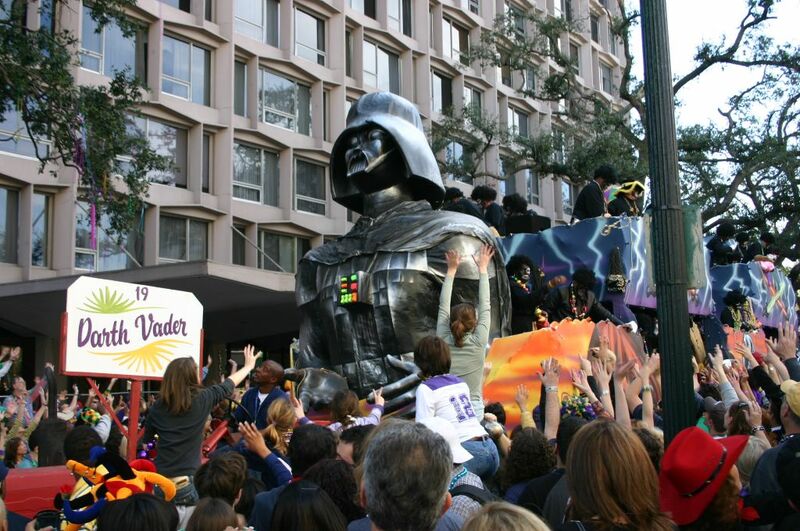 Darth Vader — one of the Zulu floats! 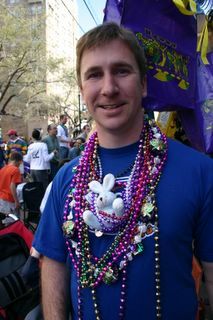 Paul: adorned with throws and the Travel Bunny!!! 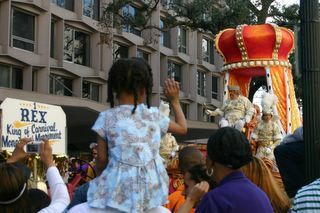 Rex: the king of Carnival! It was the first Rex King that decided the colors of Mardi Gras, still used today: Purple, Green, and Gold. 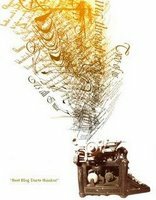 They have significance as well. 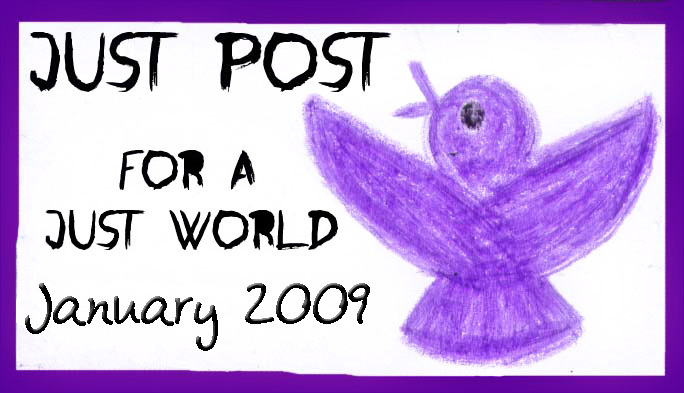 Purple is for justice, gold for power, and green for faith.